In clubs, Party of Four may be configured as four large chairs around a table, or as a banquette or sofa located directly across from a cocktail table and two chairs. Table height and size vary, but none are high enough or big enough for dining. Party of Four in club settings is not the same as a dining configuration with a Four-Top table and chairs. There are several ways to distinguish between these practices, including the size and height of a table, set-ups, distances between tables, seat height and angle of chair backs and lighting. Tables in the Party of Four configuration are small, because they are primarily for drinks. Set-ups may include candles; historical photographs indicate ashtrays as common. The Four-Top table in restaurant settings is larger, because dinner is served. Set-ups may include silverware, napkins, chargers, plates, water and/or wine glasses, salt and pepper shakers and a flower arrangement. Party of Four tables are placed close together, because privacy is not a priority; dining Four-Tops and chairs are spaced further apart. The seat height for chairs also differentiates application. Seats in Party of Four are low to the floor, and the angle of the chair is for lounging. 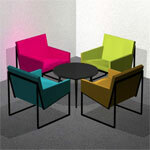 Chairs for Four-Top configurations are standard height; the angle of the seat is more upright than club settings. Both club and restaurant settings use low and soft ambient lighting, as well as candlelight, but in club settings, the light is very low and may also include dramatic lighting, while dining room lighting is somewhat brighter in order to facilitate recognition of the food that is served. The chairs that constitute Party of Four are large, sometimes described as club chairs or lounge chairs, often upholstered. The chairs are so heavy that they cannot be moved or rearranged easily. Party of Four caters to couples, or a small group of friends. The close proximity of the club chairs of Party of Four also discourages rearrangement to include a larger group. Club or lounge chairs that are a central feature of Party of Four imply that patrons will be comfortable, and therefore, extend their stay. Party of Four is often located adjacent to, or behind the bar, or placed in its own dedicated area. Some historical photographs of piano bars also portray Party of Four arranged near a dance floor with a live band playing nearby. Since private conversation is not central to club entertainment, Party of Four acts as an observational hub so that the clientele watch other patrons. When the chairs include a swivel base, views are expanded. When these seating arrangements are placed in the center of open bar spaces, each user is offered a different vantage point. The sightlines can be focused centrally on the internal group of people, or externally to the dance floor, bar or other lounge spaces. Those looking in from the perimeter or passing by also observe the activity within Party of Four. Thus, Party of Four achieves a significant goal of the bar and nightclub industry-that of seeing and being seen. This chronological sequence is based on primary sources, including the following design trade magazines: Interior Design, Architectural Record and Hospitality Architecture + Design. In addition to these sources, evidence comes from historical photographs, especially those from the American Memory Collection in the Library of Congress. The photographs are particularly informative when they picture people smoking, drinking, conversing-activities that are often missing in design trade sources. These historical sources also reveal the use of Party of Four not only in bars and nightclubs, but also on boats and ships. Prior to wine tastings as entertainment, liquor distillers created "entertainment suites" for tastings within the corporate workplace. Seagram's Distillers Corporation (1939) constitutes the first documented example of this setting.1 Employees could enjoy an in-house happy hour with co-workers and clients. For Seagram's corporate office in the Chrysler Building, designer Morris Lapidus located Party of Four on the wall across from the bar. He placed two armchairs and a small cocktail table across from a curved banquette. As photographs suggest, smoking was a significant activity; the tiny tabletop included a large centered ashtray that left little room for drink glasses. Those seated in chairs could view the hand painted mural above the banquette, while those seated on the banquette observed the bar space and viewed the mural as a reflected image in the mirror. Between 1920 to 1950, politicians, business people, lawyers, lobbyists and reporters gathered at the most important bar in the world-the Club Bar in the Carlton Hotel in Washington, DC.2 The Club Bar was understood to be the place to discuss business or to get tips on breaking stories and scandals. Photographer Theodor Horydczak captured the Party of Four space at two different times-the first, without people, and the second, with many drinkers, bartenders and servers. The open floor plan around the highly embellished Art Deco-style bar had groupings of four large, vertically striped, club chairs placed around a small cocktail table. The photographs illustrate patrons leaning in towards the center of the table to engage in conversation. For Manhattan's Bombay Bar at Essex House (1956), industrial designer Raymond Lowey centered Party of Four, flanked on one side by the bar, leaving just enough room to walk between the two settings.7 This placement facilitated interaction with, and views of people, in the lounge and bar space. Leather club chairs surrounded a much smaller marble-topped table. The height of the space and special finish of the ceiling was emphasized to those seated at Party of Four. The photographic record of Eero Saarinen's TWA terminal (1948-1963) at Idlewild Airport (now the John F. Kennedy International Airport) included the Lisbon Lounge, located next to the bar.8 The Lounge hosted a captured audience-those waiting in the airport. The flying public had unlimited access to this space throughout the day, so it needed to accommodate the morning coffee crowd as well as daytime drinkers with pre-flight jitters and those about to venture off on holiday. Photographed in 1958, the Lounge accommodated the bar at one end of the space. Most of the floor area, however, featured Party of Four. Modified wing-back chairs at a dining seat height, and larger than usual cocktail tables (more like coffee tables), reveal the compromises evident in solving the special design problems of a twenty-four hour space. Cruising experienced a resurgence of popularity in the late 1950s and 1960s when royalty and celebrities embarked on month-long holidays all over the world. Post-World War II cruising also proved to be a more economical travel choice than air travel for the middle and upper classes. Photographs of the SS Brasil (1958), a Raymond Loewy project for the Moore-McCormack Lines, reveals luxurious spaces. The steamship accommodated 550 travelers sailing from New York to Buenos Aires Argentina.9 The scheme for the lounge and club space alternated between curved walls with murals and flat walls with opaque panels. Large rectangular booths were aligned along the rounded perimeter. The majority of the floor space was dominated by Party of Four with alternating dark and light lounge chairs at each table. Unlike the tables at the Lisbon Lounge, the table was also dining height. In 1960 Italian maritime furniture designer Gustavo Pulitzer developed furniture, and the interior design of the Bamboo Room, Galleon Bar and Riviera Nightclub aboard the SS Victoria. A conscious effort was made to maximize leisurely public spaces on the floating resort. The lounges were only some of the several mini-drinking and dancing environments on the ship that cruised between New York City and the Greek Islands of the Mediterranean.13 The Bamboo Room Nightclub was located against the bow of the ship, creating a sweeping curve at the end of the space and a lowered ceiling plane. Using dark turquoise banquettes, small-surfaced built-in tables and chairs with turquoise upholstered seats and backs, Pulitzer wrapped Party of Four around the perimeter of the space. An ancillary space to the banquettes was also populated with Party of Four. All seating arrangements took up little floor space and were confined to a burgundy colored carpet, so that the parquet wooden dance floor became the focus of activity. The bar in the Top of the First (1961), Ponce De Leon Calle, San Juan, Puerto Rico, was designed by the internationally known industrial designer Raymond Loewy and his partner William Snaith.14 The lounge was located behind sliding screens that separated the space from the bar in a narrow hall-like space only large enough to line up Party of Four settings with a circulation path to the side. Party of Four was comprised of low streamlined pieces-a dark leather, armless, two-seater sofa sat opposite two upholstered armchairs. Several sets of Party of Four ran the length of the space. The space felt intimate, because of the constriction of space and a decorative ceiling surface that visually lowered the ceiling. Similar to the configuration in the Bamboo Bar on the S.S. Victoria, close-knit groupings faced either the bar or took in the view from fifteenth floor windows. For the cocktail lounge adjacent to the Rib Room restaurant (1964) in the Hotel America, the firm of Roland William Jutras Associates brought Party of Four to Connecticut's capital by installing straight-back two-seater sofas set across from two deeply tufted side chairs.16 This Party of Four was organized in the center of the lounge space, with no backing walls at all. However, both the sofas and the chairs were high-backed, providing a kind of half-wall. A Wunderkammer17 wall displayed awards, recognitions and artifacts. Ellen McCluskey designed the interiors for Crown's Hamburg Plaza (1973) in West Germany. McCluskey's designs had been praised for the innovative solutions that were responsive to the local climate, cultures, traditions and needs of each client.29 Like the nighttime venue of Jacaranda Country Club, the Blue Satellite discotheque, located on the roof level of Crown's thirty-two story complex, was photographed during the day. A birds-eye-view depicted Party of Four along the edge of the room with a backdrop of two-story windows that framed a Borrowed View30 of the city. Mirrored surfaces reflected four round Thonet chairs arranged around square cocktail tables. Jutras + Nicholson Associates also designed an "extremely contemporary and sophisticated interior space with no traditional identity items" for the Bristol Place Hotel in Toronto. The designers believed that this concept provided guests with a memorable interior experience catering to unique amenities that also attracted non-hotel guests.32 In November of 1973, Interior Design published the concept's execution in the hotel's Dr. Livingston's Disco. Patrons escaped their routine in the discotheque filled with antique African carvings and contemporary paintings juxtaposed by glowing lights and high-gloss surfaces. Party of Four was composed of four wicker chairs around a low cocktail table. The lounge space's material culture artifacts were directly contrasted with the contemporary Float dance floor.33 Mirror-polished chrome panels as the ceiling element reflected movement on the dance floor and those seated in Party of Four. Branson Coates Associates worked with fashion and industrial designer Takeo Kikuchi to make his boyhood dreams a reality. Inspired by street-styling and vintage eras, Kikuchi created an "artistically makeshift" installation in Bohemia Bar (1987). Architectural Record noted that Bohemia's design concept drew from the creative mind of a musician, as if one had listened to Brazilian jazz on an airplane that landed in a London Soho basement, located in Tokyo, Japan. Kikuchi collaborated on the structural design for the large metal exhaust piping between each seating grouping to further push the concept.46 The materiality within the space was derived from the bold syncopation of color and pattern that represented a visual expression of musical improvisation in the jazz club. Coates incorporated Party of Four, again occurring behind the bar and Down the Line, as a row of old British Airway plane seats that acted as the banquette component across from custom chairs. The chronological sequence builds a strong base of evidence for the practice of Party of Four as archetypical. It is seen in stand-alone establishments for bars and clubs, and also recognized throughout other practice types and venues, such as hotel lobbies, restaurant lounges, recreational facilities, transportation, and even in a few instances, workplaces. Bar and club interiors during the decades of 1950 and 1960 were almost as staid as interiors in corporate workplaces or the post-war home. Colors were muted, "natural," or "earth tones". Very little modern furniture was used in Party of Four settings. Often the chairs are over-sized, possibly gendered for males. Little theming occurred during this period with the exception of the Ninth Floor Bar in the Houston Astrodome (1965) and the Circus Circus Casino (1969). Some of the seating choices gained consistency with the exception of Arne Jacobsen's Egg and Swan chairs that appeared in the early examples for the 1970s. The Swan chair was also used in the 2000 decade, proving to be a transcendent choice for designers in this Intype. Ergonomic mechanisms were slowly being incorporated into the design of the seating. The most common selection during the 1970s were chairs with rounded backs and supports that were bent in the front and balanced by the weight of the person in the seat. In the 1980s many bars and clubs were located in adaptive use projects of historical buildings that were transformed into nightlife entertainment venues. Compared to previous decades when Party of Four was often located at the edge of a dance floor, during the decade of 1980 the furniture configurations were directly adjacent to a bar, or removed as an intimate conversational grouping. The decade of 1990 was the only instance in which there were few examples in printed and photographic sources. It is possible that the interior archetype Shuffle became the preferred furniture arrangement during this period. Shuffle59 is more flexile than Party of Four, because it accommodates various sized parties and occupies less floor space. During the decade of 2000, many of the "would be" Party of Four applications were in spaces that transitioned from daytime dining to nighttime clubbing. The tables used in these spaces were much too large to be considered a cocktail table, and served as a Four-Top transitioned into a bar-like setting. The published examples of Party of Four during the 2000s include more custom designed seating that is lower to the ground plane. The vertical height of the spaces was further emphasized and refocused the patron on the intimate grouping that the Intype creates. This chronological sequence is largely located within hotel lobbies. From 1930 to 2010 the height of the cocktail table varied greatly, ranging from low to high. The distinguishing feature, however, is that the table is not large enough to accommodate dining purposes. Regardless of its height, the table is just large enough for drinks and a bowl of snacks. 1) Bar, Seagram's Distillers Corporate Office  Morris Lapidus, interior design; Chrysler Building, New York City in American Memory (Library of Congress): LC-G612- 35838, LC-G612- 35851; PhotoCrd: Gottscho-Schleisner, Inc.
2) Photographic Caption: "Politicians, business men, lawyers, lobbyist and reporters would gather at what was understood to be the most important bar in the world-the Carlton Hotel, Club Bar"; Carlton Hotel, Club Bar [1920-1950] Designer Unidentified; Washington, D.C. in American Memory, (LC-H824- 1951-003; Library of Congress); PhotoCrd: Theodor Horydczak. 3) SS American, Piano Bar & Smoking Lounge, United States Lines  Eggers & Higgins Architects, Smyth, Urquhart & Marckwald; Various Locations in Reuben Goossens, "Maritime Historian: SS America" ssMaritime.com; http://www.ssmaritime.com/ss-america-australis.htm (accessed: Apr. 23, 2011). 4) Fred A. Bernstein, "Décor from Post-War Ships," New York Times Web; Sept. 2010; http://www.nytimes.com/2010/09/09/garden/09ship.html (accessed Apr. 23, 2011). 5) Bar, United Nations Building  Oscar Niemeyer, architect; New York City in American Memory, (Library of Congress): LC-G613- 62658; LC-G613- 62660; LC-G613- 62659; PhotoCrd: Gottscho-Schleisner. 6) C.J. Hughes, "UN Headquarters Gets $1.8 Billion Facelift; Upgrading an Icon," Architectural Record Web; Sep. 2010 http://archrecord.construction.com/news/daily/archives/2010/09/100920UN_Campus.asp (accessed: Apr.23, 2011). 7) Essex House, Bombay Bar  Designer: Raymond Loewy & Associates; New York City in American Memory (Library of Congress): LC-G613- 69793; PhotoCrd: Gottscho-Schleisner, Inc.
8) Lisbon Lounge, Idlewild Airport  Knox & Murphy LaFarge; New York City in American Memory (Library of Congress): LC-G613- 71789; PhotoCrd: Gottscho-Schleisner, Inc.; "Trans World Airlines Flight Center, John F. Kennedy International Airport, Queens, New York; Eero Saarinen & Kevin Roche," Landmarks Preservation Corporation, http://www.npclibrary.org/db/bb_files/Trans-World-Airlines-Flight-Centre.pdf (accessed: Apr. 23, 2011). 9) Nightclub Lounge, Steamship Brasil, Moore McCormack Line  Raymond Loewy Associates; Goossens, Reuben, "Maritime Historian: Moore-McCormack Lines, SS Brasil" (ssMaritime.com); http://www.ssmaritime.com/ss-america-australis.htm (accessed: Apr. 23, 2011). 10) The architectural records and papers (1925-1975) of Jac Lessman are located in the Avery Architectural and Fine Arts Library at Columbia University. The collection includes a significant number of original and reprographic interior design and architectural drawings for interiors designed by Lessman throughout the United States and the Caribbean. Records are primarily for hotel, restaurant, club, and resort commissions. Also included are office files and scrapbooks related to his projects and business practices. http://www.columbia.edu/cu/lweb/archival/collections/ldpd_6882189/ (accessed Oct. 1, 2011). 11) Sky Bar, Desert Inn  Jac Lessman, design; Las Vegas, NV in Anonymous, "Jac Lessman's Las Vegas," Interior Design 30, no. 10 (Oct. 1959): 149; PhotoCrd: Virginia McIntire. 12) Punch Bowl Cocktail Lounge, Colony Motel  Neal Prince, AIA, ASID, Walter Ballard Corp.; Atlantic City, NJ in Anonymous, "Hotels," Interior Design 30, no. 10 (Oct. 1959): 168; PhotoCrd: Anonymous. 13) Goossens, Reuben. "Maritime Historian: M.S. Victoria" ssMaritime.com; http://www.ssmaritime.com/dc-victoria-photo.htm (accessed: Apr. 23, 2011). 14) Top of the First  Raymond Loewy, William Snaith Inc; San Juan, Puerto Rico in American Memory (LC-G613- 76589; LC-G613- 76589; Library of Congress); PhotoCrd: Samuel Gottscho. 15) Gil Hodges Lanes, Cocktail Lounge  Elsie Remmert, esign; Brooklyn, New York, NY in Anonymous, "Bowling Alleys," Interior Design 33, no. 10 (Oct. 1962): 209; PhotoCrd: James Vincent; historic postcard, http://brooklynpix.com/photoframex1.php?photo=/photo1/F/flatlands50.jpg&key=FLATLANDS%2050 (accessed Oct. 2, 2011). 16) Rib Room Bar, Hotel America  Roland William Jutras, Curtis And Davis; Hartford, CT Anonymous, "Hartford's Hotel America," Interior Design 35, no. 7 (Jul. 1964): 73; PhotoCrd: Alexandre Georges. 17) Most web sites about the Bacardi Tower building credit the other interior designer as Alberto Fernando Pla. Wunderkammer describes an historic exhibition aesthetic in which entire walls or ceilings were covered by a multitude of artifacts arranged by taxonomy. Contemporarily, the term refers to assemblages that cover entire interior planes of related or disparate objects. Jasmin Cho, "Theory Studies: Archetypical Practices of Contemporary Restaurant Design." (M.A. Thesis, Cornell University, 2009), 65-75; Joori Suh, "Theory Studies: Contemporary Museum and Exhibition Spaces," (M.A. Thesis, Cornell University, 2003), 117-20; The Interior Archetypes Research and Teaching Project, Cornell University, http://www.intypes.cornell.edu/intypesub.cfm?inTypeID=51 (accessed Oct. 6, 2011). 18) Bacardi Office Bar  Adela P. Estrada, Alberto Fernandez; Miami, FL in Anonymous "Bacardi Moves to Miami," Interior Design 35, no. 5 (May 1964): 126-128; PhotoCrd: Ernest C. Graham. 19) Houston Astrodome  Finger Contract Supply Co., furnishings; Charles H. Barton, Carol Willhite, William V. Griffin, Manning Mann; Houston, TX in Anonymous, "Houston's Astrodome," Interior Design 36, no. 7 (Jul. 1965): 77; PhotoCrd: Anonymous. 20) Cocktail Lounge, Pompano Park Racecourse Clubhouse  Homer A. Shrewsbury, Jr.; Pompano Park, FL in Anonymous, "Win, Place, Show," Interior Design 36, no. 10 (Oct. 1965) 213. PhotoCrd: Anonymous. 21) Chateau Fleur De Lis Restaurant, Bar  Alan Ferry, Hugh Latta, Cooper, Salzman & Carry Architects; Atlanta, GA in Anonymous, "Restaurants," Interior Design 37, no.4 (Apr. 1966): 190; PhotoCrd: Alexandre Georges. 22) Club Atlantis, Regency Hyatt  Edwards and (John) Portman, Roland William Jutras; Atlanta, GA in Anonymous, "Regency Hyatt House," Interior Design 38, no.9 (Sept. 1967): 142; PhotoCrd: Alexandre Georges. 23) Bratenahl Residential Community Bar  Theodore Hofstatter and Company, Julian B. Abbott, A.R. Kupilik, Designers; Cleveland, OH in Anonymous, "New Concepts for Gracious Living," Interior Design 38, no.11 (Nov. 1967): 104; PhotoCrd: Alexandre Georges. 24) Circus Circus Casino  Franklin Design (SF), Jo Harris, Rissman & Rissman Architects; Las Vegas, NV in Anonymous, "Circus Circus," Interior Design 40, no. 3 (Mar. 1969): 96-101; PhotoCrd: Anonymous. 25) Arne Jacobsen designed Egg Chair in 1958. It is still manufactured by Fritz Hansen. http://www.fritzhansen.com/en/egg-easy-chair-3316 (accessed: Oct. 8, 2011). 26) Alfie's  Brock Arms, Addkison Enviromental Designers; Chicago, IL in Anonymous "AID Conference: Brock Arms," Interior Design 42, no.8 (Aug. 1971): 126-127; PhotoCrd: Idaka. 28) Jacaranada Country Club, Bar & Lounge  Terry L. Rowe and Associates, Donald Singer, interiors; Plantation, FL in Anonymous, "The Jacaranada Country Club," Interior Design 43, no. 7 (Jul. 1972): 60-65; PhotoCrd: Alexandre Georges. 29) New Hamburg Plaza, Blue Satellite Discotheque  Ellen McCluskey, interiors; Hamburg, West Germany in Anonymous "Hamburg Plaza Crowns New German Complex," Interior Design 44, no. 7 (Jul. 1973): 78; PhotoCrd: Anonymous; Ellen Lehman McCluskey, http://jwa.org/encyclopedia/article/mccluskey-ellen-lehman (Accessed: Oct. 8, 2011). 31) New Hamburg Plaza, Cocktail Lounge & Discotheque  Ellen McCluskey, interior design; Hamburg, West Germany in Anonymous "Hamburg Plaza Crowns New German Complex," Interior Design 44, no. 7 (Jul. 1973): 77-79; PhotoCrd: Anonymous. 32) Bristol Place Hotel Bar  Jutras + Nicholson Associates, interiors, Webb, Zerafa, Menkes, Housen Architects; Toronto, Canada in Anonymous, "Teamwork in Toronto," Interior Design 44, no. 11 (Nov. 1973): 128-132; PhotoCrd: Alexandre Georges. 33) Float is a weight-bearing floor plane comprised of a translucent material that is lit from below, giving an unnatural effect. Joanne Kwan, "Theory Studies: Archetypical Artificial Lighting Practices in Contemporary Interior Design," (M.A. Thesis, Cornell University, 2009), 143-66; The Interior Archetypes Research and Teaching Project, Cornell University, www.intypes.cornell.edu (accessed Nov. 2, 2011), http://www.intypes.cornell.edu/expanded.cfm?erID=165. 34) Grand Saloon & Lounge, Mississippi Queen Steamboat  Albert P. Hinckley, James Gardner; David Beer, Welton Becket & Associates; New Orleans, LA in Anonymous, "A Luxury Hotel Designed to Float Down the Mississippi to New Orleans," Architectural Record 162, no. 5 (Oct. 1977): 113-15; PhotoCrd: Marvin Rand. 36) Egret Bar, Restaurant Jonathan Jack Cosner; New Orleans, LA in Anonymous, "Restaurant Jonathan," Interior Design 48, no. 7 (Jul. 1977):100-104,107; PhotoCrd: Jamie Ardiles-Arce. 37) Chalfonte-Hadden Hall: The Chalfonte Hotel was built in 1868 by Elisha and Elizabeth Roberts. Hadden Hall was estsblished across the street by Samuel and Susanna Hunt in 1869. The two buildings were merged by Leeds & Lippincott via skyway to create the complex. Historical American Buildings Survey (HABS, Library of Congress): HABS NJ,1-ATCI,4, Survey number HABS NJ-869; http://memory.loc.gov/cgi-bin/query/D?hh:5:./temp/~ammem_4ruM, (accessed: Oct. 8, 2011). 38) Rendezvous Bar & Lounge  Valerian Rybar, interior design; Atlantic City, NJ in Anonymous, "Resorts International," Interior Design 49, no. 11 (Nov. 1978): 180-87; PhotoCrd: Jamie Ardiles-Arce, Carl Shuman. 39) The Belvedere Hotel: In 1903, Parker and Thomas constructed the hotel with a French Beaux Arts style. It was a popular lodging location for several political figures and celebrities. The Belvedere was considered historically significant because it shaped a great deal of the Baltimore City skyline during the first quarter of this century. The hotel was added to the National Register of Historic places in August of 1977; National Register of Historic Places: Properties in Baltimore City. Maryland Historical Trust, http://mht.maryland.gov/nr/NRDetail.aspx?HDID=429&COUNTY=Baltimore%20City&FROM=NRCountyList.aspx?COUNTY=Baltimore%20City (accessed: Oct. 8, 2011). 40) The Thirteenth Floor, Cocktail Lounge & Bar, Belvedere Hotel  Adaptive Reuse (Parker and Thomas, 1903), Rita St. Clair Associates, Victor Frankel; Baltimore, MD in Anonymous, ‘Upbeat Ambience in Downtown Baltimore,' Interior Design 51, no. 4 (Apr. 1980): 242-5; PhotoCrd: Ron Solomon. 41) Sherry Netherland Hotel: Located on the corner of East 59th and Fifth Avenue, the site was originally occupied by the 1890 construction of The Netherland Hotel, designed by William Hume. This hospitality project was built by Schultze & Weaver (Leonard Schultze and S. Fullerton Weaver) as a design collaboration with Buchman & Kahn (Albert Buchman and Ely Kahn), completed in 1927.; Norval White & Elliot Willensky, "AIA Guide to New York City," Fourth Edition (New York: Three Rivers Press, 2000): 382. 42) New York City Landmark Preservation Commission, "Guide to New York City Landmarks," Fourth Edition, (New York: Wiley, 2009): 154. 43) Doubles Bar & Lounge, Basement of Sherry Netherland Hotel  Valerian Rybar; New York, NY in Edie Cohen, "Two by Valerian Rybar," Interior Design 51, No. 4 (Apr. 1980): 230-35; PhotoCrd: Jamie Ardiles-Arce. 44) Bellair Café and Grill  Barton Meyers Associates; Toronto, Canada in M.G., "Barton Meyers Associates," Architectural Record 170, no. 3 (Mid-Feb. 1982): 101-103; PhotoCrd: Michel Proulx. 45) Tango Restaurant, Bar  Chicago Art & Architecture, Garret Eakin, John Banks; Chicago, IL in Anonymous, "IBD/Interior Design Awards," Interior Design 54, no. 11 (Nov. 1983): 172-73; PhotoCrd: David Clifton. 46) Bohemia Bar  Branson Coates Associates; Takeo Kikuchi, design collaboration; Tokyo, Japan in D.K.D., "Blame it on the Bossa Nova," Architectural Record 175, no. 11 (Mid-Sep. 1987): 150-51; PhotoCrd: Paul Warchol; Takeo Kikuchi Bio, http://www.world.co.jp/takeokikuchi/index.html, (accessed: Oct. 9, 2011). 47) Light Body is a large translucent three-dimensional architectural object, or element, such as a column, that is lit fully from within to produce a glowing light. A Light Body is not planar. Joanne Kwan, "Theory Studies: Archetypical Artificial Lighting Practices in Contemporary Interior Design." (M.A. Thesis, Cornell University, 2009): 126-42. The Interior Archetypes Research and Teaching Project, Cornell University, www.intypes.cornell.edu (accessed Nov. 2, 2011). http://www.intypes.cornell.edu/intypesub.cfm?inTypeID=111. 48) Norfolk Airport Hilton Hotel Bar  Ahearn-Schopfer and Associates; Norfolk, VA in John D. Coville, "Hotel & Restaurant Design, Norfolk Airport Hilton" Interior Design 59, no. 1 (Jan. 1988): 294-99; PhotoCrd: Peter Vanderwarker. 49) Stardust Lounge, Shin Umeda City Complex  Hiroshi Hara, architect; Atelier, interior design; Interspace Time, lighting design; Osaka, Japan in Clifford A. Pearson, "Lighting; High Wire Act," Architectural Record 182, no. 2 (Feb.1994): 36-41; PhotoCrd: NACA'SA & Parters. 50) Vitrine is a glass showcase for the display of significant or ordinary objects. Kristin Malyak, "Theory Studies: Archetypical Retail Practices in Contemporary Interior Design," (M.A. Thesis, Cornell University, 2011), 232-95. The Interior Archetypes Research and Teaching Project, Cornell University, www.intypes.cornell.edu (Nov. 2, 2011). http://www.intypes.cornell.edu/intypesub.cfm?inTypeID=126. 51) Jackie Nightclub  Dam & Partners Architecten; Rotterdam, Netherlands in Marta Serrats, Bar Design (New York: Daab, 2006): 46-51; PhotoCrd: Luuk Kramer. 52) Gravity bar and lounge, Guinness Storehouse  RKD Architects; Dublin Ireland in Anonymous, "Glass and Steel Pour On the Charm," Architectural Record Web Exclusive Archives (Nov. 2005); PhotoCrd: Gerry O'Leary. 54) Semiramis Hotel Athens  Karim Rashid; Athens, Greece in Anonymous, "Checking into an Artwork," Architectural Record Web Exclusive Archives (Nov. 2005); PhotoCrd: Jean-Francois Jassaud. 55) Marriott Horseshoe Bay Resort, Lobby Lounge & Bar  Glover Smith Bode, Ryan Eshelman; Horseshoe Bay, TX in Bruce Adams, "Hill Country," Hotel Design (Apr./May 2006): 98-100; PhotoCrd: Mark Knight. 56) Hotel Valley Ho  Allen + Philp Architects; Scottsdale, AZ in Anonymous, "Restoration and Expansion," Architectural Record Web Exclusive Archives (Nov. 2006); PhotoCrd: Mark Boisclair Photography Inc., Historic Photography Courtesy: Hotel Valley Ho; Hotel Valley Ho, http://www.scottsdaleaz.gov/Assets/Public+Website/historiczoning/SHRrptHotelValleyHoI.pdf (accessed: Sept. 10, 2011). 57) Lobby, Bar, Lounge, The Yas Hotel  Asymptote Architecture; Yas Island, Abu Dabi in Anonymous, "The Yas Hotel," Architectural Record Web Exclusive Archives (May 2010); PhotoCrd: Gerry O'Leary. 58) Lobby, Bar, Lounge, Robert Restaurant Philip Michael Wolfson, Johanna Grawunder, Schefer Design; New York City in Nicholas Tamarin, "Atop the Museum of Art & Design," Interior Design Web Archives (Jan. 2010);PhotoCrd: Anonymous; Flower Chair  Pierre Paulin, design; Magis, manufacturer in Italy. http://www.magisdesign.com/#/products/3/118/gallery/sheet/ (accessed: Oct. 8, 2011). 59) Shuffle is an informal seating group composed of lightweight backless seat-furniture that can be rearranged easily to produce a random order. Shuffle accommodates a variety of group sizes and spatial configurations and implies mobility, flexibility and open authorship of a space for temporary seating purposes. Carla Wells "Theory Studies: Archetypical Practices of Contemporary Bar and Nightclub Design." (M.A. Thesis, Cornell University, 2011): 194-241. 60) Evidence for the use and the chronological sequence of Part of Four as a bar and nightclub archetype was developed from the following sources: 1930 Bar, Seagram's Distillers Corporation Office  Morris Lapidus, interior design; Chrysler Building, New York City in American Memory (Library of Congress): LC-G612- 35838, LC-G612- 35851; PhotoCrd: Gottscho-Schleisner, Inc. / Club Bar, Carlton Hotel [1920-1950] Designer Unknown; Washington, D.C. in American Memory, (Library of Congress): LC-H824- 1951-003, LC-H814- 1555-002-x; PhotoCrd: Theodor Horydczak / 1940 Piano Bar & Smoking Room, SS American, United States Lines  Eggers & Higgins Architects, Smyth, Urquhart & Marckwald; Various Locations in American Memory (Library of Congress): LC-G612- 38104; PhotoCrd: Gottscho-Schleisner, Inc. / 1950 Bar, United Nations Building  Oscar Niemeyer, architect; New York City in American Memory, (Library of Congress): LC-G613- 62658; PhotoCrd: Gottscho-Schleisner / Piano Bar & Smoking Room, SS American, United States Lines  Eggers & Higgins Architects, Smyth, Urquhart & Marckwald; Various Locations in Reuben Goossens, "Maritime Historian: M.S. Victoria, Princess" ssMaritime.com; PhotoCrd: Rueben Goossens / Essex House, Bombay Bar  Designer: Raymond Loewy & Associates; New York City in American Memory (Library of Congress): LC-G613- 69793; PhotoCrd: Gottscho-Schleisner, Inc. / Lisbon Lounge, Idlewild Airport  Knox & Murphy LaFarge; New York City in American Memory (Library of Congress): LC-G613- 71789; PhotoCrd: Gottscho-Schleisner, Inc. / Nightclub Lounge, Steamship Brasil, Moore McCormack Line  Raymond Loewy Associates; American Memory (Library of Congress): LC-G613- 73066, LC-G613- 73081; PhotoCrd: Gottscho-Schleisner, Inc. / Sky Bar, Desert Inn  Jac Lessman, design; Las Vegas, NV in Anonymous, "Jac Lessman's Las Vegas," Interior Design 30, no. 10 (Oct. 1959): 149; PhotoCrd: Virginia McIntire / Punch Bowl Cocktail Lounge, Colony Motel  Neal Prince, AIA, ASID, Walter Ballard Corp.; Atlantic City, NJ in Anonymous "Hotels," Interior Design 30, no. 10 (Oct. 1959): 168; PhotoCrd: Anonymous. / 1960 Bamboo Room Nightclub, M.S. Victoria, Incres Line  Gustavo Pulitzer, furniture design in Reuben Goossens, "Maritime Historian: M.S. Victoria, Princess" ssMaritime.com; PhotoCrd: Ruben Goossens / Bamboo Room Nightclub, M.S. Victoria, Incres Line  Gustavo Pulitzer, furniture design in American Memory (Library of Congress): LC-G613- 75142, LC-G613- 75141; PhotoCrd: Gottscho-Schleisner, Inc. / Top of the First  Raymond Loewy, William Snaith Inc; San Juan, Puerto Rico in American Memory (Library of Congress): LC-G613- 76588; LC-G613- 76589; PhotoCrd: Samuel Gottscho / Gil Hodges Lanes, Cocktail Lounge  Elsie Remmert, design Brooklyn, New York City in Anonymous, "Bowling Alleys," Interior Design 33, no. 10 (Oct. 1962): 209; PhotoCrd: James Vincent / Gil Hodges Lanes, Cocktail Lounge  Elsie Remmert, design; Brooklyn, New York City, historic postcard, http://championsofthering.com/Gil%20Hodges%20Bowling%20Alley%20pc.jpg (accessed Oct. 2, 2011) / Rib Room Bar, Hotel America  Roland William Jutras, Curtis And Davis; Hartford, CT Anonymous, "Hartford's Hotel America," Interior Design 35, no. 7 (Jul. 1964): 73; PhotoCrd: Alexandre Georges / Bacardi Office Bar  Adela P. Estrada, Alberto Fernando Pla. ; Miami, FL in Anonymous "Bacardi Moves to Miami," Interior Design 35, no. 5 (May 1964): 128; PhotoCrd: Ernest C. Graham / Houston Astrodome, Sky Dome  Finger Contract Supply Company, furnishings; Charles H. Barton, Carol Willhite, William V. Griffin, Manning Mann; Houston, TX in Anonymous, "Houston's Astrodome," Interior Design 36, no. 7 (Jul. 1965): 77; PhotoCrd: Anonymous / Cocktail Lounge, Pompano Park Racecourse Clubhouse  Homer A. Shrewsbury, Jr.; Pompano Park, FL in Anonymous, "Win, Place, Show," Interior Design 36, no. 10 (Oct. 1965): 213; PhotoCrd: Anonymous / Chateau Fleur-de-lis Restaurant, Bar  Alan Ferry, Hugh Latta, Cooper, Salzman & Carry Architects; Atlanta, GA in Anonymous, "Restaurants," Interior Design 37, no.4 (Apr. 1966): 190; PhotoCrd: Alexandre Georges / Le Parasol, Regency Hyatt  Edwards and Portman, Roland Wm. Jutras; Atlanta, GA in Anonymous, "Regency Hyatt House," Interior Design 38, no.9 (Sep. 1967): 142; PhotoCrd: Alexandre Georges / Bratenthal Residential Community Bar  Theodore Hofstatter and Company, Julian B. Abbott, A.R. Kupilik, Designers; Cleveland, OH in Anonymous, "New Concepts for Gracious Living," Interior Design 38, no.11 (Nov. 1967): 104; PhotoCrd: Alexandre Georges / Piano Bar & Smoking Room, SS American, United States Lines  Eggers & Higgins Architects, Smyth, Urquhart & Marckwald; Various Locations in Reuben Goossens, "Maritime Historian: M.S. Victoria, Princess" ssMaritime.com; PhotoCrd: Rueben Goossens / Ding-a-Ling-a-Ring Bar (left), Circus Circus Casino  Franklin Design, Jo Harris, Rissman & Rissman Architects; Las Vegas, NV in Anonymous, "Circus Circus," Interior Design 40, no. 3 (Mar. 1969): 99; PhotoCrd: Anonymous / Hippodrome Theatre & Supperclub, (right), Circus Circus Casino  Franklin Design, Jo Harris, Rissman & Rissman Architects; Las Vegas, NV in Anonymous, "Circus Circus," Interior Design 40, no. 3 (Mar. 1969): 100; PhotoCrd: Anonymous / Horse-A-Round Bar (Left), Circus Circus Casino  Franklin Design, Jo Harris, Rissman & Rissman Architects; Las Vegas, NV in Anonymous, "Circus Circus," Interior Design 40, no. 3 (Mar. 1969): 101; PhotoCrd: Anonymous / Café Metropole (Right), Circus Circus Casino  Franklin Design, Jo Harris, Rissman & Rissman Architects; Las Vegas, NV in Anonymous, "Circus Circus," Interior Design 40, no. 3 (Mar. 1969): 101; PhotoCrd: Anonymous. / 1970 Alfie's  Brock Arms, Addkison Enviromental Designers; Chicago, IL in Anonymous "AID Conference: Brock Arms," Interior Design 42, no.8 (Aug. 1971): 126; PhotoCrd: Idaka / Alfie's  Brock Arms, Addkison Enviromental Designers; Chicago, IL in Anonymous "AID Conference: Brock Arms," Interior Design 42, no.8 (Aug. 1971): 127; PhotoCrd: Idaka / Jacaranada Country Club, Bar & Lounge  Terry L. Rowe and Associates, Donald Singer, interior design; Plantation, FL in Anonymous, "The Jacaranada Country Club," Interior Design 43, no. 7 (Jul. 1972): 65; PhotoCrd: Alexandre Georges / Jacaranada Country Club, Bar & Lounge  Terry L. Rowe and Associates, Donald Singer, interiors; Plantation, FL in Anonymous, "Jacaranada Country Club," Architectural Record 152, no. 5 (Oct. 1972): 120; PhotoCrd: Alexandre Georges / New Hamburg Plaza, Blue Satellite Discotheque  Ellen McCluskey, interior design; Hamburg, West Germany in Anonymous "Hamburg Plaza Crowns New German Complex," Interior Design 44, no. 7 (Jul. 1973): 78; PhotoCrd: Anonymous / New Hamburg Plaza, Galleon Bar, Cocktail Lounge  Ellen McCluskey, interior design; Hamburg, West Germany in Anonymous "Hamburg Plaza Crowns New German Complex," Interior Design 44, no. 7 (Jul. 1973): 79; PhotoCrd: Anonymous / Bristol Place Hotel Bar  Jutras + Nicholson Associates, interior design, Webb, Zerafa, Menkes, Housen Architects; Toronto, Canada in Anonymous, "Teamwork in Toronto," Interior Design 44, no. 11 (Nov. 1973): 131; PhotoCrd: Alexandre Georges / Grand Saloon & Lounge, Mississippi Queen Steamboat  Albert P. Hinckley, James Gardner; David Beer, Welton Becket & Associates; New Orleans, LA in Anonymous, "A Luxury Hotel Designed to Float Down the Mississippi to New Orleans," Architectural Record 162, no. 5 (Oct. 1977): 115; PhotoCrd: Marvin Rand / Egret Bar, Restaurant Jonathan  Jack Cosner; New Orleans, LA in Anonymous, "Restaurant Jonathan," Interior Design 48, no. 7 (Jul. 1977): 104; PhotoCrd: Jamie Ardiles-Arce / Rendezvous Bar & Lounge  Valerian Rybar, interior design; Atlantic City, NJ in Anonymous, "Resorts International," Interior Design 49, no. 11 (Nov. 1978): 182; PhotoCrd: Jamie Ardiles-Arce, Carl Shuman. / 1980 The Thirteenth Floor, Cocktail Lounge & Bar, Belvedere Hotel  Adaptive Reuse (Parker and Thomas, 1903), Rita St. Clair Associates, Victor Frankel; Baltimore, MD in Anonymous, "Upbeat Ambience in Downtown Baltimore," Interior Design 51, no. 4 (Apr. 1980): 245; PhotoCrd: Ron Solomon / Doubles Bar & Lounge, Basement of Sherry Netherland Hotel  Valerian Rybar; New York City in Edie Cohen, "Two by Valerian Rybar," Interior Design 51, No. 4 (Apr. 1980): 232; PhotoCrd: Jamie Ardiles-Arce / Bellair Café and Grill  Barton Meyers Associates; Toronto, Canada in M.G., "Barton Meyers Associates," Architectural Record 170, no. 3 (Mid-Feb. 1982): 101; PhotoCrd: Michel Proulx / Tango Restaurant, Bar  Chicago Art & Architecture, Garret Eakin, John Banks; Chicago, IL in Anonymous, "IBD/Interior Design Awards," Interior Design 54, no. 11 (Nov. 1983): 173; PhotoCrd: David Clifton / Bohemia Bar  Branson Coates Associates; Takeo Kikuchi, design collaboration; Tokyo, Japan in D.K.D., "Blame it on the Bossa Nova," Architectural Record 175, no. 11 (Mid-Sep. 1987): 150; PhotoCrd: Paul Warchol / Norfolk Airport Hilton Hotel Bar  Ahearn-Schopfer and Associates; Norfolk, VA in John D. Coville, "Hotel & Restaurant Design, Norfolk Airport Hilton" Interior Design 59, no. 1 (Jan. 1988): 297; PhotoCrd: Peter Vanderwarker. / 1990 Stardust Lounge, Shin-Umeda Sky City Complex  Hiroshi Hara, architect; Atelier, interior design; Interspace Time, lighting design; Osaka, Japan in Clifford A. Pearson, "Lighting; High Wire Act," Architectural Record 182, no. 2 (Feb.1994): 40; PhotoCrd: NACA'SA & Partners / Stardust Lounge, Shin-Umeda Sky City Complex  Hiroshi Hara, architect; Atelier, interior design; Interspace Time, lighting design; Osaka, Japan in Clifford A. Pearson, "Lighting; High Wire Act," Architectural Record 182, no. 2 (Feb.1994): 41; PhotoCrd: NACA'SA & Partners. / 2000 Jackie Nightclub  Dam & Partners Architecten; Rotterdam, Netherlands in Marta Serrats, Bar Design (New York: Daab, 2006): 46; PhotoCrd: Luuk Kramer / Gravity bar and lounge, Guinness Storehouse  RKD Architects; Dublin Ireland in Anonymous, "Glass and Steel Pour On the Charm," Architectural Record Web Exclusive Archives (Nov. 2005); PhotoCrd: Gerry O'Leary / Semiramis Hotel Athens  Karim Rashid, design; Athens, Greece in Anonymous, "Checking Into an Artwork," Architectural Record Web Exclusive Archives (Nov. 2005); PhotoCrd: Jean-Francois Jassaud / Marriott Horseshoe Bay Resort, Lobby Lounge & Bar  Glover Smith Bode, Ryan Eshelman; Horseshoe Bay, TX in Bruce Adams, "Hill Country," Hotel Design, (Apr./May 2006): 99; PhotoCrd: Mark Knight / Hotel Valley Ho  Allen + Philp Architects; Scottsdale, AZ in Anonymous, "Restoration and Expansion," Architectural Record Web Exclusive Archives (Nov. 2006); PhotoCrd: Mark Boisclair Photography Inc. / 2010 Lobby, Bar, Lounge, The Yas Hotel,  Asymptote Architecture; Yas Island, Abu Dabi in Anonymous, "The Yas Hotel," Architectural Record Web Exclusive Archives (May 2010); PhotoCrd: Gerry O'Leary / Lounge, Robert Restaurant  Philip Michael Wolfson, Johanna Grawunder, Schefer Design; New York, NY in Nicholas Tamarin, "Atop the Museum of Art & Design," Interior Design Web Archives (Jan. 2010);PhotoCrd: Anonymous / Lounge, Robert Restaurant  Philip Michael Wolfson, Johanna Grawunder, Schefer Design; New York, NY in Anonymous, "Robert Restaurant," http://robertnyc.com/ (accessed: Sep. 9, 2011). 2) Wells, Carla. "Theory Studies: Archetypical Bar and Nightclub Practices in Contemporary Interior Design." M.A. Thesis, Cornell University, 2012, 139-92.